Furniture is expensive and moving can be a hassle. Luckily, some apartments in Birmingham come fully furnished to take some of the headache out of moving. These Birmingham apartments in the Five Points neighborhood, built in the 1920s, have great historic charm. If you are looking for a furnished, historic apartment close to UAB and Downtown Birmingham, LaSalle could be the place for you. If a modern and newly furnished apartment community is more your speed, then look no further than 20 Midtown in Downtown Birmingham. They opened in early 2017 and have all the modern conveniences, such as flat screen TV’s, granite counter tops, stainless steel appliances and a media room. 20 Midtown also features a commercial space that’s home to aPublix, Chipotle and an AT&T store. Hickory Knoll, just off Lakeshore Drive, offers residents quick access to a variety of stores and restaurants in Homewood, Alabama. Not only will you be able to get a furnished apartment, you’ll also get access to an on-site pool and sundeck as well as clubhouse. Colony Woods, situated behind Grandview Medical Center just off Highway 280, offers furnished apartments. It’s a great choice if you’re looking for something outside of Birmingham as it has two tennis courts, a Cyber Cafe with Wi-Fi, and an outdoor kitchen with grill and fireplace. 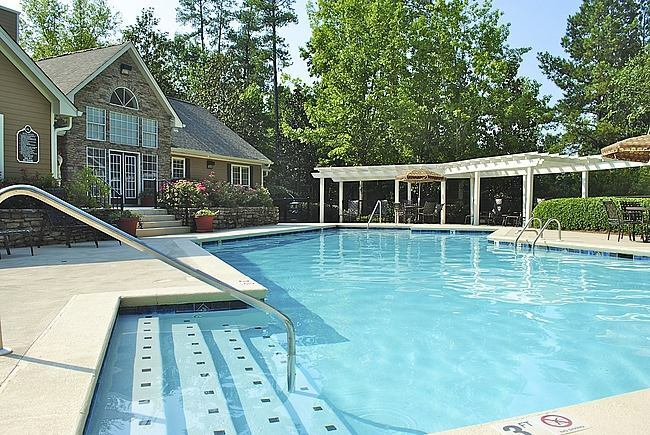 This neighborhood in Grandview allows quick access to Highway 280 as well as the interstate. Turtle Lake also offers furnished apartments. Tucked away from the hustle and bustle, this apartment community in the Birmingham neighborhood of Inverness allows residents to live in a tranquil environment on the shores of a beautiful lake. It’s the perfect getaway as they offer hiking, biking, and walking trails to take you away from the stress of your work day.